When I was a child I spent all of my summers with my grandparents in their country house (called dacha). My grandparents were great gardeners. They had everything from classic fruit trees to richly-flavored basil plants with every kind of berry and vegetable in between. If you have a garden, you might be familiar with a short and crazy time each summer when all the berries start getting ripe at the same time. Rising sea of berries. We would give a bucket full of fresh berries to each of our city neighbors and the postman would get one too. And still there would be berries in bowls, buckets, and pots on every surface of a rickety veranda. My grandma would look at me sternly (that was her habit) and say, “We should start making plans about what we gonna do with all these berries.” And I would think, “Do with berries? She is crazy! Eat them fresh, of course!” Remember that was the time before the year-round-berry supply. The only time anyone got to eat berries was when they were ripe in their region. So, I would start stuffing myself with sweet, juicy berries. The first day it would be all I would eat. The second day I would eat less of berries and more of other things. By day third I wasn’t sure what all the fuss was about. Each bite seemed to be less satisfying than the one before. By day four I would rather eat anything else but berries. That’s when my grandma would have to get inventive about making me eat the berries that kept coming. That’s how this berry treat came into existence. Another modern addition to this recipe is yogurt. Yogurt didn’t make it to Soviet Union until some time in the 90s. 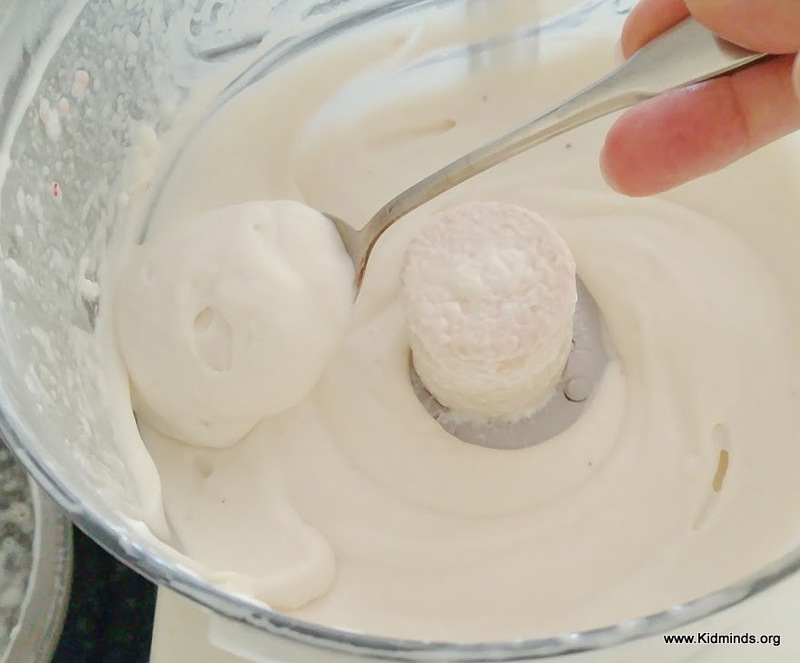 But the Russian dairy product used in this recipe (village sour-cream, деревенская сметана) had a bit of a different texture and creamed up differently. 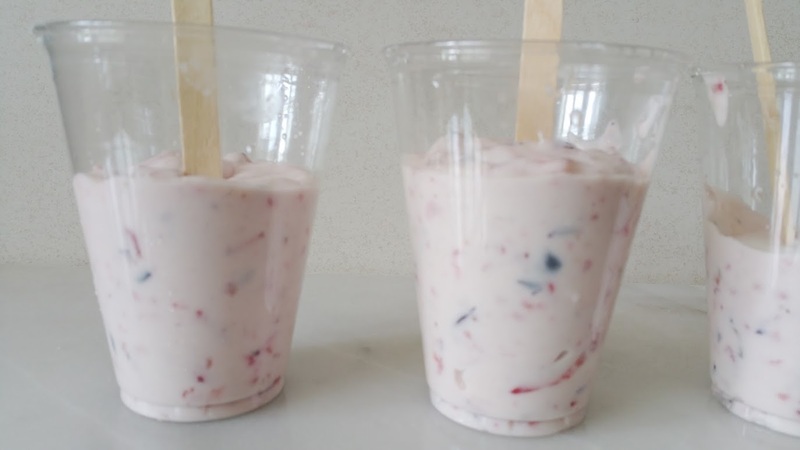 When I first made this recipe with American ingredients, it just didn’t seem to be the right consistency, so I ended up adding yogurt and I’m glad I did. It definitely improved things and boosted the probiotics factor too. 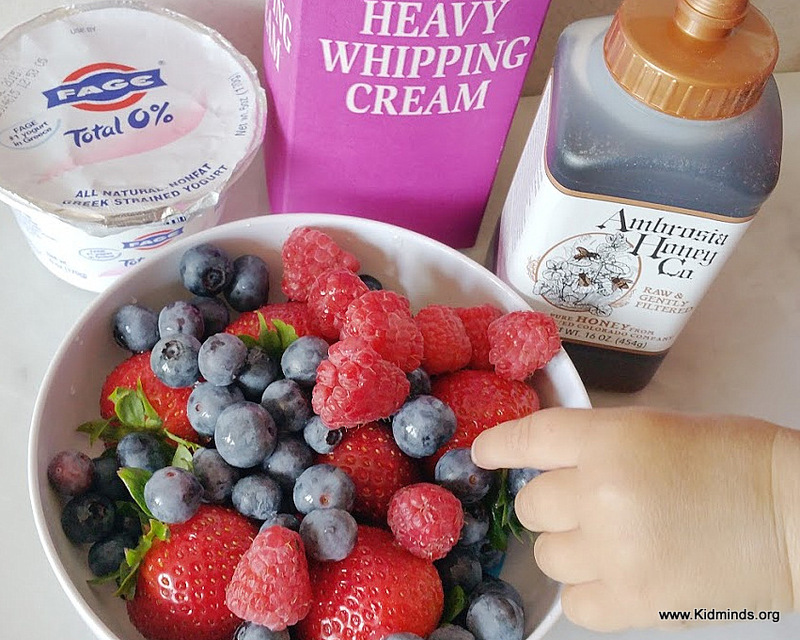 There are only four ingredients involved whipped cream, yogurt, berries and honey (сливки, ягоды, мед и йогурт). I own popsicle molds, but I always end up using little paper cups instead. With my grandma we reused ice-cream wrappers inserted in cups. Today I’m using Panera Bread water cups. Oh-oh!! Someone is trying to steal the berries! I better be quick and take a photo before they all disappear! 1 cup of berries cut in small pieces (you don’t have to be precise here. The only reason I measured the berries today was because I was going to make a post. Otherwise, I just chop until it feels right and then I stop). 1. Cut up berries and gather all your ingredients. 2. 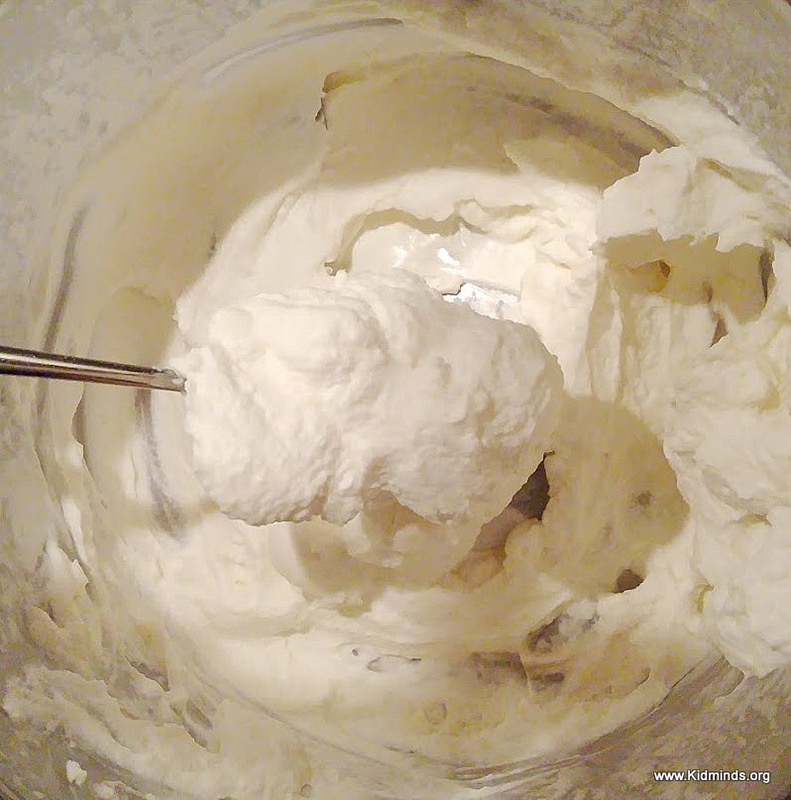 Add heavy whipping cream and honey to a blender or food processor and whip it until it thickens. 3. 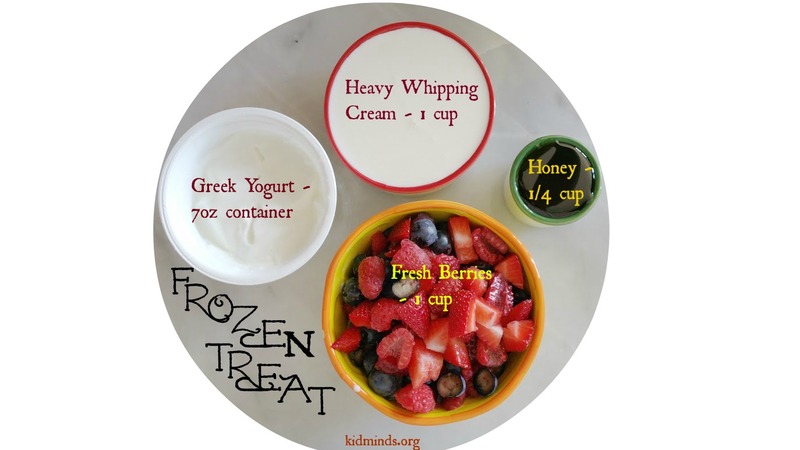 Add yogurt and give it a quick whirl just until blended. 4. 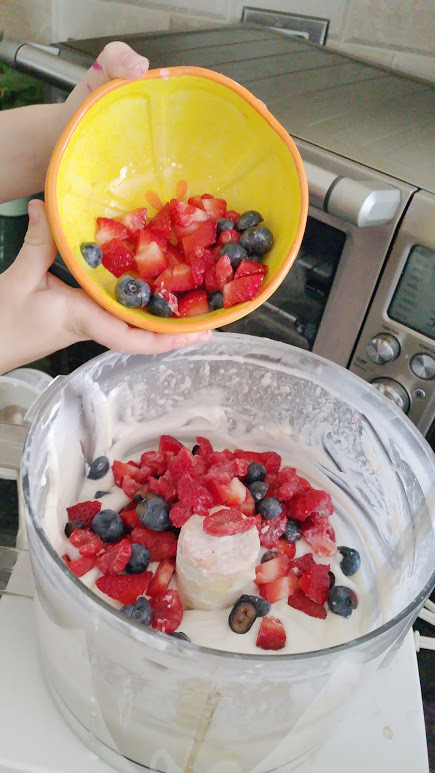 Add berries and either mix in with a spoon or give a short, little whirl in a blender to get them incorporated into the yogurt mix. I try not to puree the berries. 5. Divide between four cups and insert sticks. The cups should have been full but there was a lot of tasting involved. 6. Freeze overnight. When you are ready to eat them just hold the cups under the warm running water or put them in a bowl with water for a few minutes. Don’t pull on the stick while the treat is still frozen or it will just pop out and there will be tears. We would choose this treat over ice-cream any day! 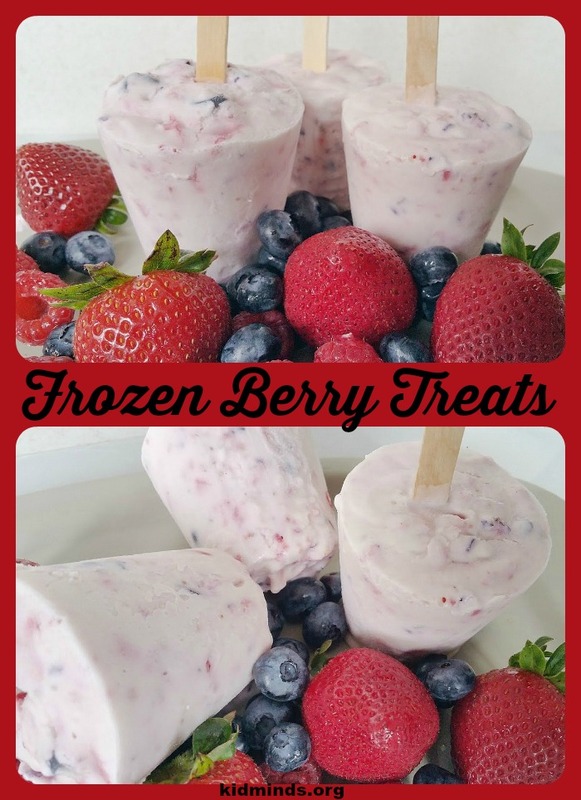 Hey Buddy!, I found this information for you: "Frozen Berry Treat – Замороженное Чудо". 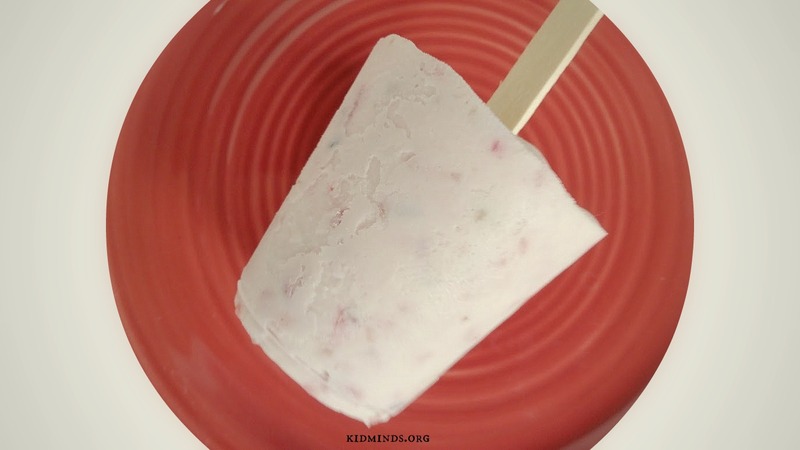 Here is the website link: http://kidminds.org/frozen-berry-trea/. Thank you.